The Honeywell Power HPFF8 is an 8.0A notification appliance circuit (NAC) expander fire rated power supply designed to extend the power capabilities of existing NACs and provide power for auxiliary devices. 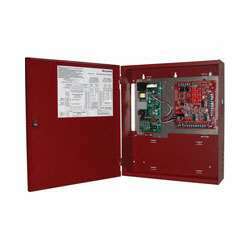 The HPFF8 connects to any 12 or 24V Fire Alarm Control Panel (FACP) or operates stand-alone. The unit provides regulated and filtered 24VDC power to four NAC's and an auxiliary output. The HPFF8 is mounted in a lockable wall cabinet that can accommodate up to two 18AH batteries and contains an internal Battery charger capable of charging up to 26.0 amp-hour (AH) batteries. Separate Trouble and AC Fail Form-C relay contacts.